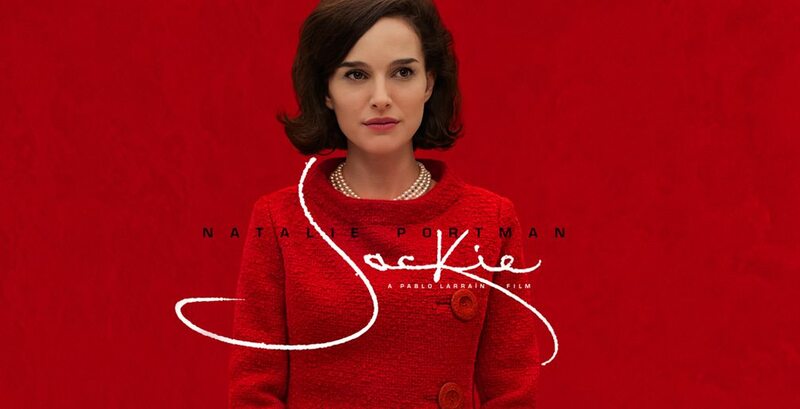 I think Natalie Portman has come closest of most actresses in capturing the essence of her as a human being vs. the usual stereotypical portrayal (along with, in my opinion, Blair Brown in "Kennedy"). The White House TV tour felt very authentic to me. I imagine those who have never seen the real TV tour might think it's a cheap impersonation and won't realize just how spot-on Portman is in recreating it. She certainly has come closest to capturing Jackie's public and private voices. The sets are also impressive, although "Hyannis Port" felt more like a lake house (which, I'm guessing, the property used for filming was). But this is not a documentary. And that's really important to keep in mind for those of us who have followed this story so closely and know it in greater detail than those who haven't. It would be easy to fall into the trap of nitpicking it to death. Yes, there are some obvious -- and in many instances quite avoidable -- factual inaccuracies. Again, it's a dramatic storytelling, not a documentary. I think you have to recognize going in that the timing of some things is off and has been condensed...it's a collection of snapshot scenes pieced together with flashbacks back and forth and out of order, etc. For me, many things triggered deep emotional responses, and some are actually jarring -- it's one thing to see the fuzzy, grainy, yet still dramatic Zapruder film. It's quite another thing to see that scene recreated in extreme close-up. (Part of the very brief recreation is what it must have looked like from Nellie Connally's position). It takes your understanding of the horror to a different level. 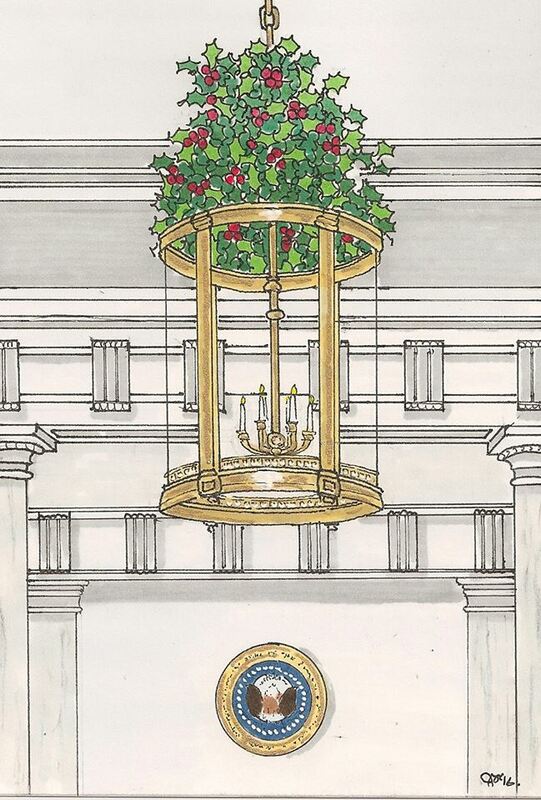 December 24, 2016 Notes: Rendering by Jake Gariepy of Jackie's White House Entrance Hall 1961 decorated for the holiday season. November 21, 2016: As Michelle Obama's era as First Lady comes to an end, many champions and foes alike are acknowledging her important legacy and impact. First and foremost she has been a wife and mother in the style of Jackie Kennedy and Bess Truman. She has been fiercely protective of her family's privacy and created a comfortable home setting for her husband, children, and mother. But this hominess came with a dramatic sense of modern style. Her fashion, home decor, and entertaining have been beyond forward thinking - she has been a trailblazer. Her White House garden has spawned a renewed interest in home and school-based gardening that has not seen since the likes of World War II victory gardens. Her White House state dinner menus were healthy, fresh, and tasty. Her White House china featured a color known as Kailua Blue," a bright blue color inspired by the hue of the sea in President Barack Obama's home state of Hawaii. She partnered with interior designer Michael Smith to personalize the private quarters and for significant updates to the Oval Office in the West Wing, and to the Old Family Dining Room and State Dining Room on the State Floor. The Obamas choice in art was modern. Architectural Digest gave a rare glimpse into the Obama White House in their December 2016 issue. 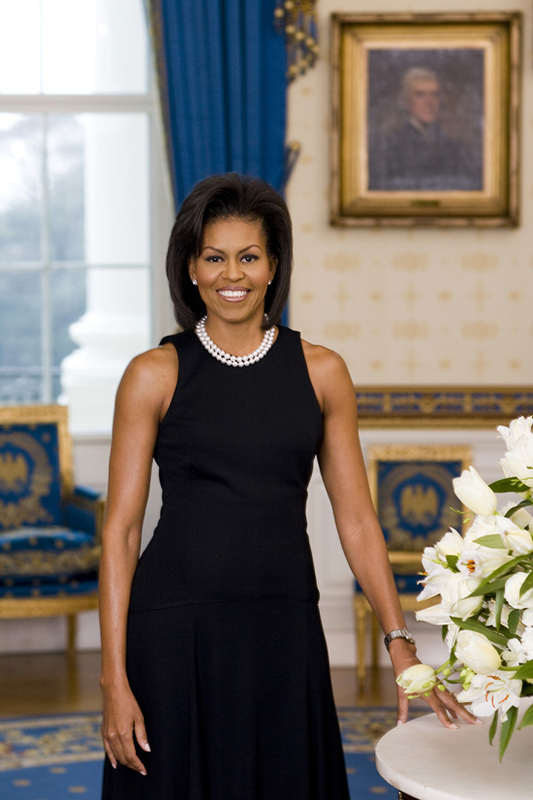 She opened the White House to Google to create virtual tours and formally allowed visitors to take their own pictures. Her impact on staffing was also historic. Angella Reid was named the Director of the President’s Executive Residence and “Chief Usher.” Reid was the ninth person and first woman to serve in the role. Jeremy Bernard served as the White House Social Secretary. He was the first male, as well as the first openly gay individual, to serve in that role. October 2, 2016: Another tastemaker in the life of Jackie Kennedy was Mrs Charles (Jayne) Wrightsman (above left), wife of an oil and gas tycoon and both major donors to the White House restoration project and the Metropolitan Museum of Art. The Wrightsman gallery, partially designed by Stéphane Boudin, assembled the finest 18th century French period rooms and furnishings in the USA, reflecting the Wrightman's passion for collecting antique French furnishings of the highest caliber. Their New York, London and Palm Beach homes (where they were neighbors of the Joseph Kennedys and where JFK swam in their heated pool), all designed by Boudin set a standard of unrivaled excellence. 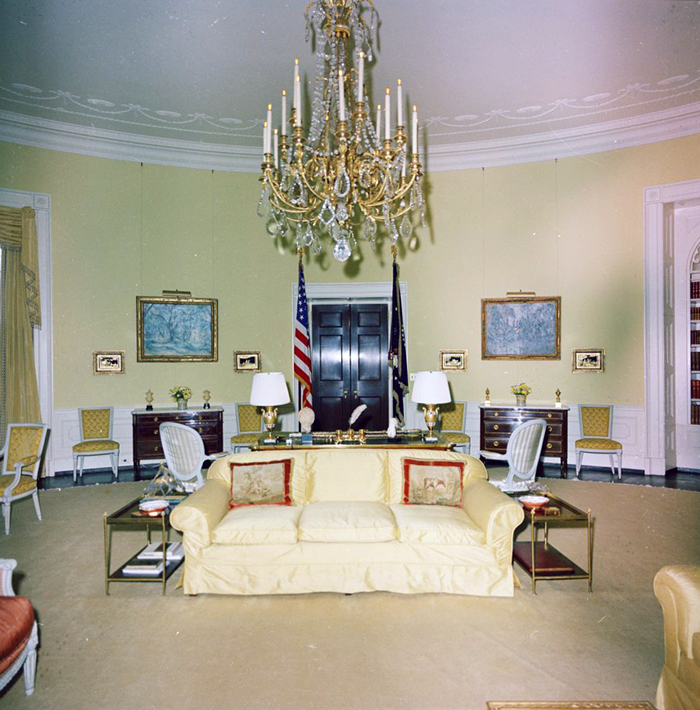 Jayne was a behind the scenes influence in Jackie's White House project, brokering a truce with Sister Parish when she threatened to resign the project due to what she perceived as Boudin's interference, and underwriting the complete and costly renovation of the Blue Room (below) in January, 1963. Jayne also worked as a kind of "shop hound," seeking out fine French antiques in Paris for Jackie's approval. 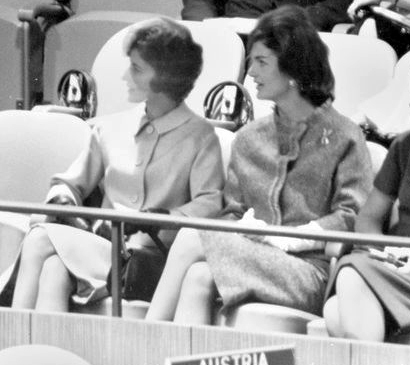 Much as with Bunny Mellon, another influential tastemaker to Jackie, Mrs Kennedy didn't entertain her women friends, she put them to work for the White House as JB West observed. Jayne served on Jackie's Fine Arts Committee for the White House, and she and her husband arranged the initial introduction to Jackie Kennedy of Henry Du Pont. Years before, it was Jayne who introduced Boudin to Senator Kennedy's young wife. Jayne opened many doors for Jackie and they remained lifelong friends. Jayne still resides in her New York apartment. The Wrightsmans avoided publicity but her connoisseurship particularly of French period furniture was an enormous help and support for the Kennedy restoration. Refer to "Designing Camelot" by James Archer Abbott for a more in depth look at Jayne Wrightsman's involvement in the Kennedy White House restoration. 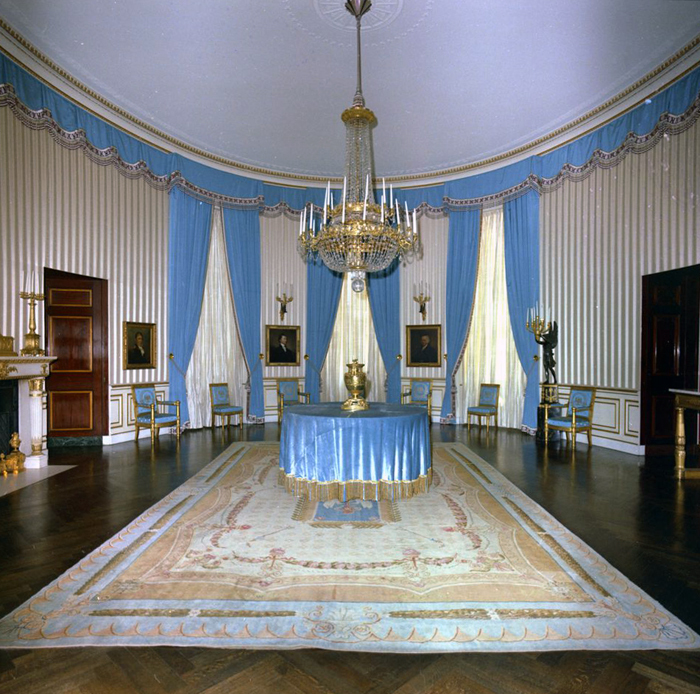 Jayne was very active in seeking antique furniture in Paris for the Kennedy's White House Yellow Oval Room (below) along with Boudin.